Loppu erä tähän hintaan, tilaa heti! These 3-piece Wilson Staff DX3 Soft Golf Balls Dozen are created around a super soft, high velocity core, which utilises advancements in rubber chemistry to maintain high initial velocity. The softest core in the game today is wrapped in a speed-generating HPF Speed Mantle for greater spin and a thin, responsive Ionomer cover that delivers soft feel with utmost durability and increased scuff-resistance. 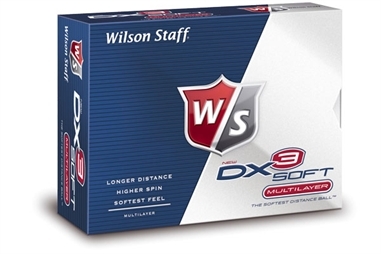 These Wilson DX3 soft golf balls make a great addition to the golf bag of any mid-high handicapper. The large, flat-bottomed, shallow dimples on these Wilson Staff DX3 Soft Golf Balls Dozen deliver a stable, penetrating golf ball flight, while the Traction Control Technology integrates with the urethane cover to produce the highest spin possible from club faces with the 25° of loft or more, providing for ultimate shot-making and scoring. Tuotteen lisäyspäivä: keskiviikkona 17 lokakuuta 2012.